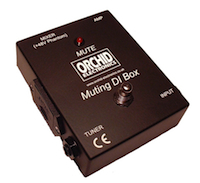 A development of our successful DI Box design - this product has a silent mute facility - which many players will find invaluable for use on stage - when changing instruments, or quiet tuning. Balanced XLR output at microphone level to feed the mixing console. This main output also mutes. Red LED indicates output mute status..
May be either battery or phantom powered - the 9V battery is housed in a drawer for easy access. Active circuitry for superb performance.